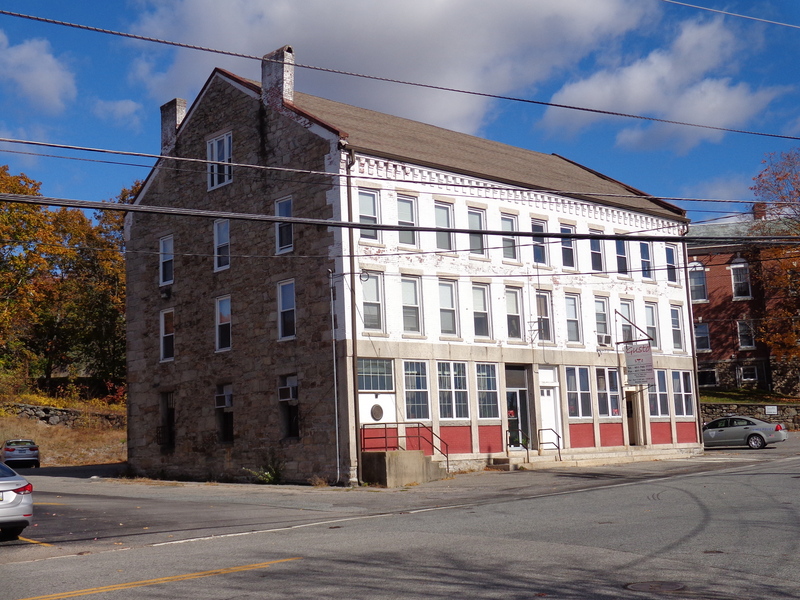 The First National Bank of North Smithfield was once located in this building on Main St. in Slatersville. Louis Bruno awoke to the sound of a “bang”, as if someone had just fired a revolver. At least that’s how he described the noise to a newspaper reporter a few hours later. The light of the moon allowed him to make out the hands of the clock on the wall. It was 1:25 a.m., and at first he wondered if he’d been dreaming. Then he heard more noises. Fully awake now, he identified them as coming from the space below his apartment, which was occupied by the First National Bank of North Smithfield. Then came another “bang” that rattled the dishes in the kitchen cabinet, and he came to realize what was happening – someone was robbing the bank! The date was March 15, 1904, and for the Burno’s, and other nearby residents of Slatersville, it was going to be a long and suspenseful night. 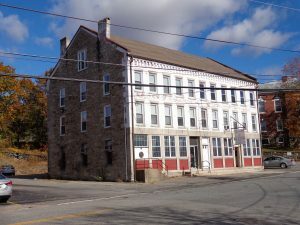 The bank in Slatersville was chartered in 1815, and opened for business three years later under the name of the Burrillville Agricultural & Manufacturers Bank. In 1824 the name was changed to “Village Bank”, and in May of 1865, the bank was nationalized, and became the First National Bank of Smithfield, and after 1871, North Smithfield. Mr. Bruno and his wife lived in an apartment directly above the bank and post office; an arrangement that would hardly be acceptable today due to security concerns. In an era before burglar alarms, institutions such as banks relied on fortress-like vaults to protect their assets. The money in this particular bank was surrounded by twenty inch thick granite blocks, with an outer layer of brick for added thickness and fire-proofing. The outer door to the vault consisted of heavy iron and was secured with a padlock. The inner door was constructed of four layers of iron, each one-inch thick. The frame and hinges were set in stone. When locked, the inner door was held in place by a sophisticated tumbler mechanism which controlled six steel pins, each one-and-a-half inches thick that extended into holes drilled in the granite. Inside the vault itself was a solid steel, Hibbard-Rodman-Ely Maganese No. 5, “burglar proof” safe, which contained the bank’s cash assets. To penetrate such a vault required time, and some expertise relating to safes and explosives. It also involved the risk of being blown to Kingdom Come. Perhaps it was for this reason that many bank robberies occurred during the daylight hours when vaults were generally left open. The Bruno’s weren’t the only people awakened by the safe cracker’s attempts to blast his way into the vault, but home telephones were scarce in 1904, and most of the citizens were too frightened to even leave their beds to investigate what was going on. Mr. Bruno was braver than the rest and thought of going for the police, but when he peered outside his window directly above the bank’s front door he saw two men standing in the shadows of a tree. Another figure lurked outside the door at the bottom of the stairs leading to the upstairs apartments, and a fourth was stationed at the back of the building. Bruno was basically trapped in his apartment with nothing to do but listen and wait. Even if he’d managed to slip out un-noticed, the town’s police force consisted of a handful of constables led by an elected Town Sergeant. Any show of force would have to come from the neighboring city of Woonsocket which had an established police department. Over the next two hours Bruno secretly watched as a fifth man went in and out of the bank setting more charges. Moments after he’d rejoin his confederates in the street there’d be another explosion. This process was repeated over and over, with each explosion being bigger and more powerful than the last. Apparently the vault was more secure then the burglars had anticipated, and even though the echoes of each blast reverberated throughout the area, they didn’t seem concerned about getting caught. The twelfth explosion was the biggest yet, dislodging plaster from the ceiling, shattering crockery, and even knocking over two chairs in the Bruno’s apartment. Once again the hopeful safe cracker entered the building to inspect his work, but emerged a minute later. There was some animated discussion between the group, but Bruno couldn’t make out the words. It was clear they didn’t have the money, yet no more attempts were made to get it. Instead, they simply strolled, (Yes, strolled.) up Main Street towards the Slatersville Congregational church. The time was now 3:30 a.m. Sometime afterwards, someone notified Charles Seagrave, the bank’s cashier, who arrived by first light to see the bank in shambles. In one corner stood a small safe, which the bank used to store documents, its lock broken and door ajar. The documents were strewn about the floor, but were otherwise untouched. It was surmised the burgers had begun their work on this safe before concentrating on the vault. The vault’s outer door had been blown open and was now irreparably twisted. This door, it was reported, had been in use by the bank since 1818. As to the inner door, one of the iron layers was blasted outward, while the other three were stove inward and wedged against the front of the “burglar proof” safe inside the vault, thereby preventing any further attempts to get at the money. The only clues left behind were a rusty axe, two chisels, and one dynamite fuse. Evidently the burglars had used all of the dynamite they’d brought for the job. North Smithfield’s Town Sergeant, William J. Allaire, determined that the gang had likely arrived in a horse-drawn wagon which they’d hidden in a shed at the nearby Congregational Church. One witness reported seeing them heading towards Millville, Massachusetts. Authorities there discovered a small railroad station had been burglarized, but nothing was taken. It was estimated that the gang had “laid low” and warmed themselves by the pot bellied stove before proceeding further. Woonsocket’s Chief of Police detailed Detective Sutton to assist North Smithfield authorities and bank examiners with the investigation. Agents of the famous Pinkerton Detective Agency were also called in. Unfortunately, as far as research could determine, nobody was ever charged with the crime. Some criticism fell to the night watchman of a nearby mill who admitted to hearing the explosions as early as 2:00 a.m., but told investigators he thought someone was shooting at Muskrats – even though it was the middle of the night. The mill was not only equipped with a telephone, but it also had a large bell that the watchman could have rung to scare away the culprits. Chief Dodge of Woonsocket told reporters that had someone telephoned his department to report the crime in progress he could have had a contingent of well armed officers on the scene within half-an-hour. Despite the damage, the bank was able to re-open for business later that morning. Before long, new doors for the vault were constructed and fitted, and the bungled bank-job of 1904 faded into history. The reader may be interested to know that the former bank building is still standing, but it hasn’t been used as a bank for decades. While apartments are still located on the upper floors, Gusto restaurant currently occupies the first floor. Its walls are adorned with historic pictures of the area. And, yes, the vault is still there, in the back behind some refrigeration units, with, I’m told, the “burglar proof” safe still inside.